In the course of production, I met a man who very recently lost his son. He shared with me a trip he took in which he observed Sri Chinmoy meditate. In the course of his grieving, the thought of this trip and the mediation master was with him. I mentioned to him Thich Nhat Hanh. Shortly after my sister died, I had been given a copy of his book, No Fear, No Death. I couldn’t read it immediately as I was so over swept with emotion but did eventually get to it. In that vein, here’s the following video. I suggest jumping to 20 to 22 minutes in and skipping directly to the dharma talk. But if you want to read a short version, try peacethroughgrieving.com on the art of suffering. It’s much the same info in listicle form. 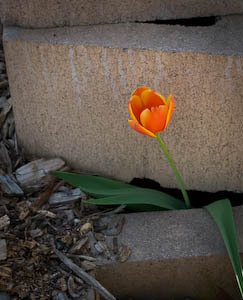 The image of the tulip growing up from stone comes from Journey Through Grief.com, also worth a visit for some thoughts on grief.